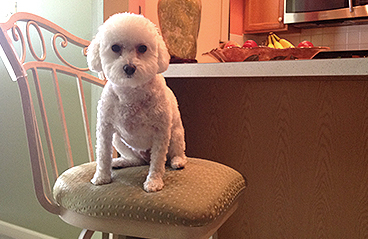 It’s easy to create a kitchen that is welcoming for both you and your pets. Although it can seem impossible to stay on top of the chewing, scratching, shedding and stains, here are a few tips to keep your home clean and pet-friendly! Dogs love to chew on the wooden legs of tables and chairs, and cats turn furniture into a scratching post. An easy way to prevent this is to choose furniture with metal legs and a powder-coated finish. Many of the stools on our site, like these by Trica, have metal construction. These pieces aren’t like the metal chairs and stools you remember from years past, though. They have a warm and welcoming look and feel. You can customize them with your favorite powder-coated finish to match any interior while keeping them free from pet attacks. Even if you choose metal barstools for your kitchen, you’ll probably still have some wooden chairs, cabinets or table legs that are prone to pet abuse. 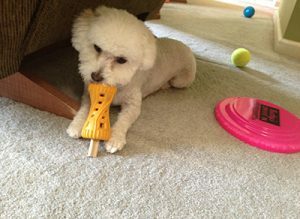 To help steer your pets away from these temptations, make sure they always have a few toys around the house. That way they can take out their chewing and scratching energy on the toys, and they won’t even think to “play” with the furniture! There’s not much you can do to keep your pet from shedding – the best you can hope for is to keep the fur under control. And no matter how much you train them, pets have accidents every now and then – but you can be ready. One trick is to make sure your furniture, flooring, carpet and upholstery will hide any fur that it picks up. Dark or patterned surfaces are great at hiding fur, stains and dirt (that’s why hotel lobbies have crazy carpets!). 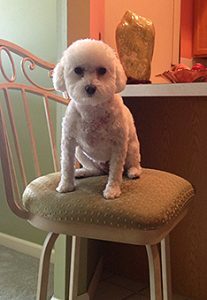 If your pet has white fur, adjust accordingly with lighter color patterns. What are your best tips for making sure that your pets and your furniture peacefully co-exist? Click here to tell us your favorites on our Facebook page!